I had a CGS66 Power Supply in the mail and I am building it tonight. Now I've run out of the parts I had around and am about to order some, among which are some 1n4004 diodes. Now my regular guy doesn't seem to have any around, but he does have the 1n4007. I wonder if could just substitute. I read the datasheet and it seems the forward voltage drop of the 1n4007 is higher and I think that would influence the workings, but would it? They should be OK to use. I think the only difference will be in their maximum ratings (the 1N4008 has a higher reverse voltage rating than the 1N4004). Allright then, thanks a lot Adam. SO allright, this thing wants a transformer and I'm considering building in this big plastic block type transformer, you know the type. Thing is, I can't easily find a center tapped one. I do think I remember seeing an image on the net somewhere of ground being taken from a non-center tapped transformer like the one above, with the aid of some (high value?) resistors. Am I getting things mixed up here? You can use a non-centre tapped transformer but the resulting DC will not be as clean as that from a CT (centre-tapped). for the difference between half wave and full wave rectification. It is okay tho, it means you can just buy an AC wallwart and do not have to deal with mains voltages. You have to do a small mod of the rectifier diodes on the PCB, check the MFOS PSU for a how-to. 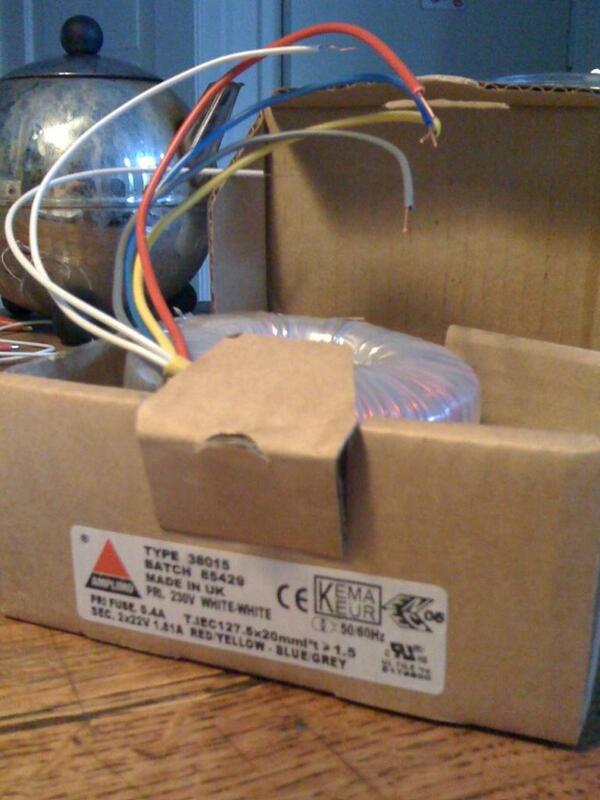 One way to get a centre-tapped transformer is to buy a multi-tapped, one with a range of outputs. Ideally for a +/-12V PSU, get one with 0,15,30 outputs (and whatever else it has). The '15' becomes your centre-tap (0V) and the '0' and '30' are your 15VAC. For a +/-15V supply, ideally you want a transformer with 0,18,36 taps, with 18 becoming your 0V centre-tap. OK I am now thinking about simply building that MFOS one on stripboard, but I need +/- 15 volts. 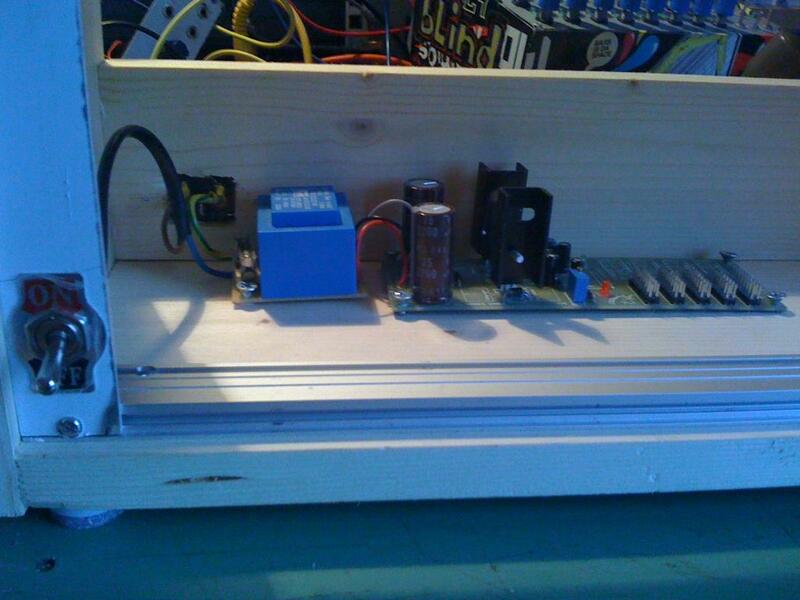 I am going to build a new rack that houses some 15V modules I would like to build, such as the JH Living VCOs. I suppose using 7815 and 7915 with this power supply should do, right? So I heard... Over and over until it really gave me the creeps! But still I just don't get it! Won't this "ground" that that MFOS circuit produces be something very different from the ground in other cabinets? In other words, won't there be any trouble? Simple answer for using that transformer - one AC output goes to the "0V" connection of the PCB. The other AC output goes to one of the "18VAC" connections. The transformer would need to be 18VAC out. Can this PCB be used with a conventional AC-wall-wart (two AC wires out)? A center tapped transformer is better, though it is possible to use a wall-wart between CT (the 0V connection on the PCB) and one 18V AC connection. The required pads are marked with large white circles. The result will be half wave rectification. If you use larger caps (3300uf) and limit the loading, you will be okay. My test bench power supply had been running like this for years. Watch the output with a CRO if you can, to find the limit. If you really wanted to, two wall-warts could be used, each between one of the 18V connections, and commoned at the CT connection. You'd have to make sure the phases were right though. With the one wire from each of the wall-warts connected together, measuring across the other two wires should give you something like 36 volts. If it gives you 0 volts, you will need to swap the wires from one of the wall-warts. What can I say? I'm just no good at reading build docs all the way down. Hits you over head with rolled up web-page. this one is a bit much eh? it is a bit much. You'd be putting 30 volts into your regulators, and that will generate a lot of heat. someday i hope to have these problems and questions. I'd like to hook up 2 CGS66 boards in parallel (one that I will build on srtipboard since I have plenty parts anyway) to it. Make this a 6U cabinet while I'm at it. The regulator chips will handle it IF you have sufficient heatsinking and don't draw too much through them. Have two strings of diodes like this, connected together at the ends. The idea is to allow the current to pass in both directions, and for the diodes to drop voltage across each. 8 diodes per low voltage coil like this will drop the voltage the regulator sees by 3 or so volts, bringing it in line with an 18V transformer. Consider adding a fan to the heatsinks. Run the fan on a lower voltage than it is meant use to slow it down and make it quieter. I just had this thing around and thought oh why not. Well that's why. I just found the correct part at Conrad and ordered 2. Using the correct part is always the best option. I trust you will cover the mains wiring so nothing can fall against it or touch the bare fuse connections.